The Ford Custom nameplate dates back to the 1930s, and was used through 1972 to describe various trim levels for Ford’s full size offerings. 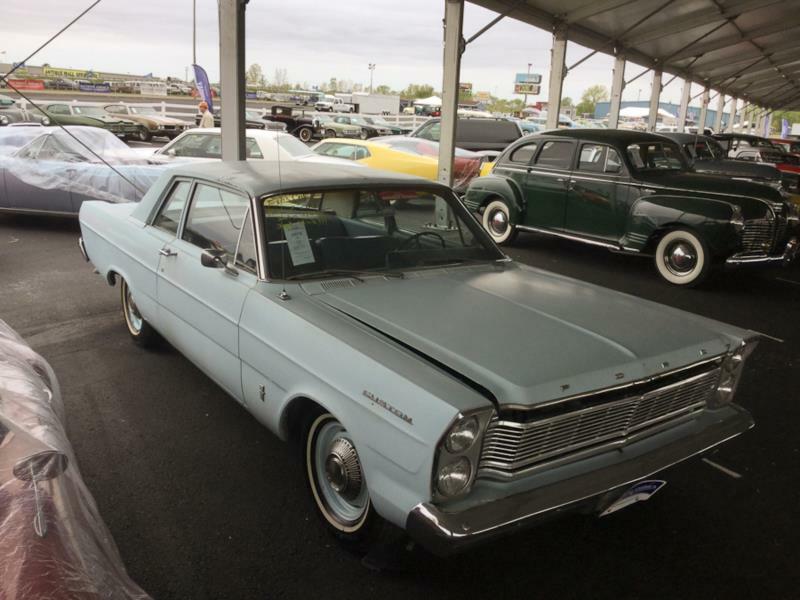 During the mid-1960s, the Ford Custom was the most basic full-size two or four door Ford you could buy. Standard trim and creature comforts were limited to sun visors, a chrome horn ring, chrome windshield and back window moldings, armrests on all doors, rubber mats, and the word “Custom” jauntily displayed on the front fenders. As a result of this Spartan trim level, most Customs in this era found their way into fleet use as taxis, police cars, and other official functions. Ford Customs from 1965 came with a variety of straight-six or V-8 engines. Inline six-cylinders ranged from 170 to 200 and 240 cid. The V-8 range started at 260 cid, and went up through basic and performance 289s, a 352, a 390, and a choice of regular or high performance 427 big blocks. If the base model was simply too much of a penalty box, buyers could opt for the Custom 500. This uprated Custom 500 offered carpet instead of mats, armrests with ashtrays, and an extra chrome spear along the front half of each side of the car. In 1966, Ford dropped the small 170-cid straight-six engine, but big block choices increased with a 410- and a 428-cid engine. The 170 came back in 1967, while, the 410 and 352 were dropped. For the last year of this generation, 1968 offered the new 302-cid small-block V-8, and a 429-cid big-block unit. The legendary Super Cobra Jet 428 was also offered in 1968, with Ford claiming 335 hp, but by all accounts actual power was well over 400. Very few 1968 Ford Custom buyers ticked this box, making them fairly desirable today. Ford Customs of this era are quite affordable given their minimal creature comforts and basic design. Enthusiasts typically look for a car equipped with a 427 or 428 engine, although the 390 is quite capable in a Custom. Anywhere from 100,000 to 250,000 Customs built for every year of this era, meaning that there should be no trouble finding a decent example. The many that were put to a commercial application were consigned to hard use but were usually well maintained, while an equal number seemed to end up in the hands of economical and sensible owners who kept the cars in good shape for dozens of years. Other than rust, the most important concern is documentation. Engine swaps are easy to execute, and they have a drastic impact on price.